I just ran across a great article in Forbes by Stephanie Kreml of Popper & Company here in Austin. After working with Doctors extensively over the past year, I’ve seen many of these trends myself and think she makes some GREAT points – do you think any of these trends apply to you and your own business? 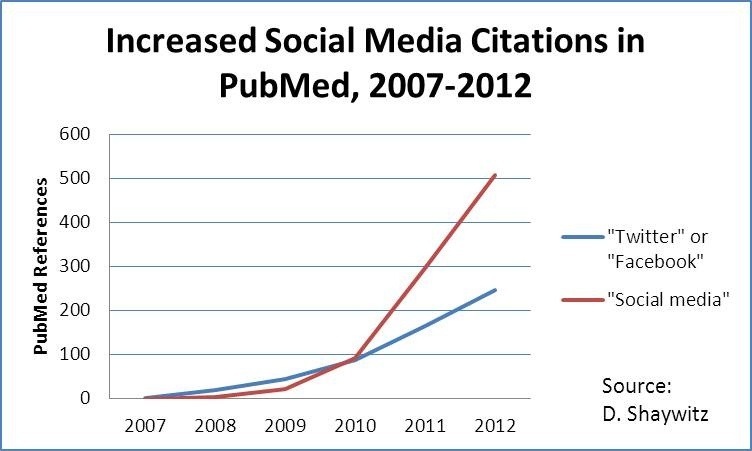 Predictably, medicine seems to be reacting to change the way it often does – by publishing (see Figure below) an ever-increasing number of journal articles (such as – not kidding – “Twitter for Neurosurgeons”), and by issuing well-intentioned (albeit largely unreadable) guidelines; this just-published position statement, from the American College of Physicians and the Federation of State Medical Boards, represents the genre well. It could be that doctors have to go through familiar, well-established processes as a way of coping with things that seem so new. At the same time, it’s hard not to get the feeling that organized medicine is effectively solemnizing the vitality out of social media. From reading all of the dry documentation discussing social media, you’d struggle to come away with any real sense of why it’s so exciting and engaging. To be sure, many of the critiques offered by senior physicians who offer the wisdom of their experience are spot on. They’re right about the hazards of online diagnosis, and right to worry about the potential harm that can be associated with the disproportional amplification of voice the internet can offer. They’re also right to urge young doctors to remember the value of professional behavior, and to celebrate reflection as a virtue. But I also suspect many senior physicians are struggling – not always successfully — to envision a world that operates in a very different way, at a very different speed, and in a very different style than that to which they’ve grown accustomed. I reject the view that the internet and social media are somehow degrading the culture of medicine, or causing it to change for the worse. Instead, I see emerging modalities as offering the profession an urgently needed chance to radically update its approach, and interact with patients, data, and each other in important new ways. Care can evolve from episodic to continuous, and physicians, increasingly accountable, will appreciate the opportunity to partner with patients who are informed, empowered, and engaged. Rather than isolating doctors, the new technology promises to be fundamentally enabling, allowing doctors to redefine and strengthen their relationships — with patients and with colleagues. The result: a new sense of connection and meaning. Medicine could be fun again.